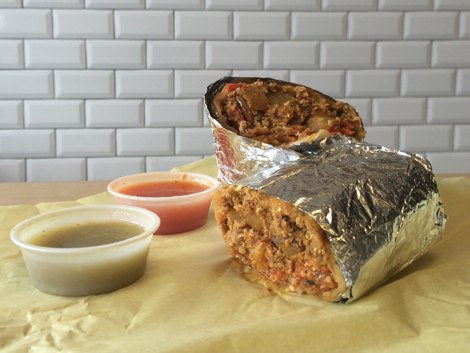 Eat Our 5 Favorite Breakfast Burritos in L.A.
Our 5 Favorite Breakfast Burritos in L.A.
From BBQ-inspired behemoths to a two-hander inspired by the holy ghost, these standout breakfast burritos will crush any hangover. We will always love breakfast burritos for their versatility: All you need is a flour tortilla, balanced fillings, and a secure wrap to achieve delicious glory. Los Angeles is in the enviable position of having top culinary talent, some of the best ingredients on the planet, an understanding of Mexican cooking traditions, and chefs who know how to stray from them and still bust out bold and inventive creations. While tacos hog most of the spotlight (and maybe for good reason), egg-bolstered breakfast burritos still hold a special place in the heart of SoCal tradition. They’re a perfect hangover cure, pre-hike holdover, or post-surf meal. 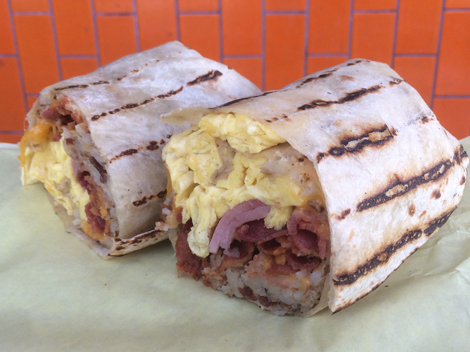 Here are five essential breakfast burritos that every Angeleno (and visitor) should know about, from remarkably crafted chorizo burritos built by BBQ pros, to market-driven, bacon-sausage wraps spearheaded by a taco savant. The fact that Cofax partners Jason Bernstein and James Starr also own Bludso’s Bar & Que is a competitive burrito advantage. That means chef Noah Galuten is able to infuse potato and tomatillo hash with wood smoke before stir-frying the combination with chorizo, onions, and peppers. Scrambled egg, pico de gallo, and crushed tortilla chips also join the tortilla-wrapped party. Cofax, which is named for Dodger legend Sandy Koufax and the coffeehouse’s Fairfax address, also produces a pair of salsas in-house. Salsa verde combines the smoked tomatillos, garlic, and charred Serranos, while salsa roja delivers more kick thanks to pan-fried chile de arbol, garlic, and charred tomatoes. 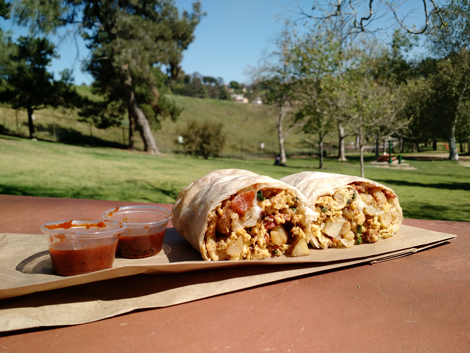 Enjoy your burrito on a wood bench while eyeing Dodger bobbleheads. Tyler King has three other L.A. branches of Coffee Commissary, where black gold is the primary focus. Burbank, however, is the only location with a full kitchen. Chef Todd Merkel helms the menu, which includes some serious breakfast burritos. His tour de force is the brisket burrito, featuring fatty beef that’s braised for 12 hours before getting crisped on the griddle. Pork belly is another solid option, featuring meaty slabs rubbed with brown sugar and spices, braised with mirin and soy sauce, and seared on the plancha. 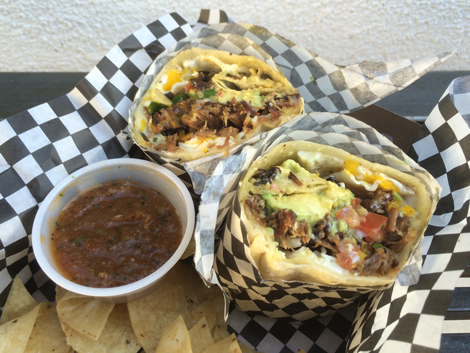 In both cases, an over easy fried egg unleashes gooey yolk into the burrito’s core, and pico de gallo adds brightness. Salsa containing chile pasilla, chile de arbol, habanero, and cilantro contributes a welcome punch. No roving chef is as committed to seasonal ingredients as Wes Avila. The Pico Rivera native, who rose through the ranks working for chefs like Walter Manzke and Gary Menes, now brings impeccable technique and creative flavor combinations to his Guerrilla Tacos truck—which parks five days a week in front of specialty coffeehouses. He has experimented with lobster and eggs, but the breakfast burrito that has stuck features bacon sausage, which Avila creates using Cook Pigs pork belly. The flour tortilla touts juicy crumbled pork and—most recently—a fried egg, queso fresco, roasted zucchini, chile morita, and cilantro, though accompaniments change frequently. What remains consistent is the container of incendiary habanero salsa that’s available to add—if you dare. This grab-and-go Atwater Village institution (and Anthony Bourdain favorite) has been open since 1994, but Maria Flores didn’t start making burritos until two years later, when she was moved to tackle the dish by the anniversary of her father’s death. Flores’ mom used to make potato and egg burritos for her husband, and he’d split them with the kids. 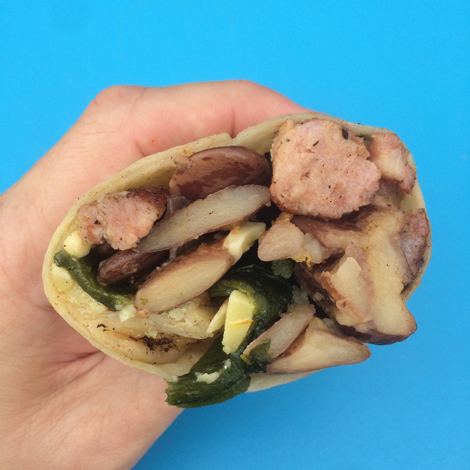 As Flores said, “Inspired by the holy spirit, you can’t go wrong.” Her breakfast burrito is downright divine, with diced skin-on potatoes, egg, onion, cilantro, mozzarella cheese, and a choice of spinach, nopales, chorizo, bacon, or chicken. From there, pour on two salsas. A red salsa touts tomato, jalapeño, garlic, and cilantro; the spicy orange option features roasted chile de arbol, garlic, and salt. Either way, you win.